The London Eye has announced a major investment of around £12.5 million to upgrade the UK's number one paid-for visitor attraction, adding in Wi-Fi and TV tech to some of its pods. Each of the Eye's 32 capsules will be upgraded one at a time to "improve their functionality, capabilities and longevity and, ultimately, enhance the customer experience" in time for the 2012 Olympics. "Planning for this project began in 2005," the company inform us in its press release, "following the removal and thorough analysis of a capsule to examine the effects of five years of business and explore what could be done to improve both the experience for visitors and the longevity and the carbon footprint of the London Eye." In addition to improvements to the current heating and ventilation system to a more efficient, environmentally friendly one, one of the upgraded capsules will initially be used to show off a range of increased technological functions, including "four ceiling mounted screens and enhanced multi-media and Wi-Fi capabilities enabling the capsule to provide music and on-screen visuals." Sandie Dawe, Chief Executive at VisitBritain comments: "We are thrilled to hear of this significant investment from the London Eye, one of the UK's top attractions, and look forward to seeing the results." 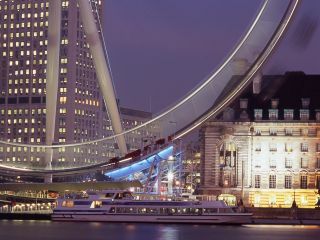 TechRadar should hopefully get a ride on the London Eye's new technologically-upgraded capsule as soon as it is 'ready to fly' – so expect more updates to follow.